This is an exciting bedroom makeover for me. 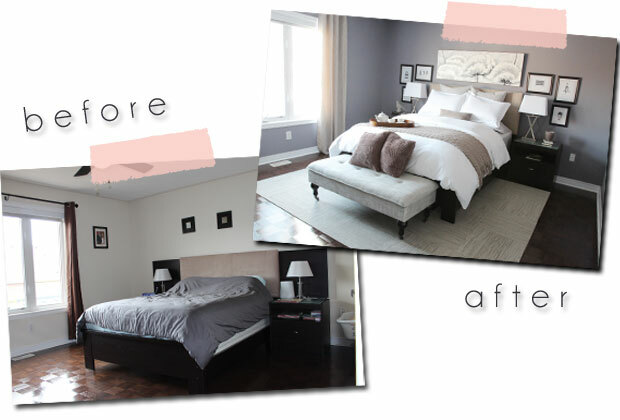 First off, you know I love a good before + after reveal and secondly, I finally get to decorate a room that is not my own! 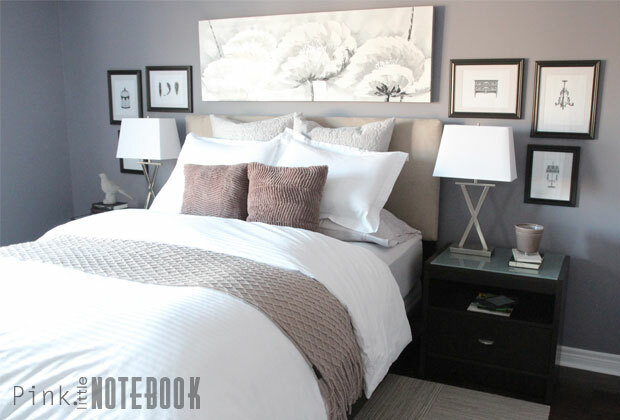 Before the holidays, my brother and sister-in-law asked me if I could help them transform their bland room into a serene master bedroom retreat. 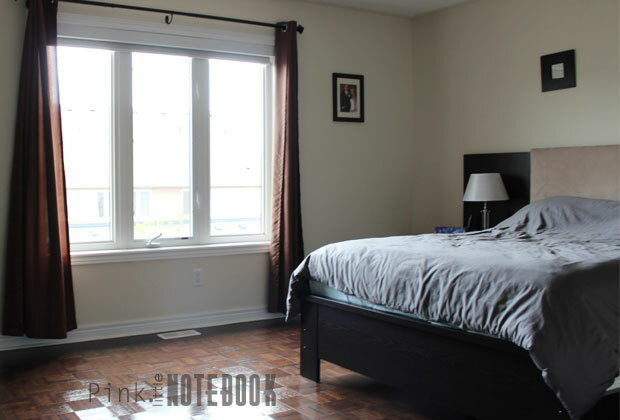 They were tired of looking at beige walls and brown drapes, it was time for change. And with another baby on the way (and probably a number of sleepless nights ahead of them), they require a room with both a relaxing and soothing atmosphere. So we took this. . .
and turned it into that. . . It all began with choosing a PARA Paint colour. 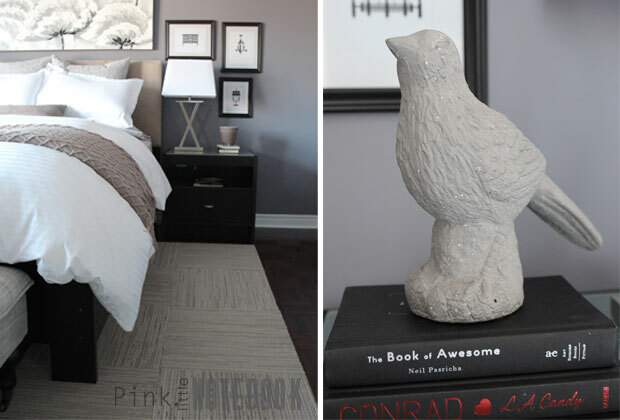 We decided to go with a sophisticated hue, Silver Touch (P5247-51, PARA Paints). This is a dark plum colour with a strong grey undertone. I’m seriously obsessed with it! This is definitely the ideal bedroom colour. It adds a punch of drama, it injects romance and it’s one hell of a classy colour (my opinion anyway!). Both my sister-in-law and I loved it instantly. My brother on the other hand, couldn’t really visualize a purplish colour on his walls. I don’t blame him, it’s hard to tell from a paint chip sometimes. But let me tell you, after the paint went up, he was on board with the whole idea. He loved it just as much as we did—both the colour—and even the ease of painting. This being his first time using PARA Paints, he was quite impressed with the amazing coverage and durability of the paint. When it came to decorating, new accessories were purchased to achieve a fresh new look. The only restriction I had was to use their existing furniture. Their bedroom set was purchased when they got married and having spent a lot of money on it, they were not ready to part with it. Plus it still looked brand spanking new. We did alter the headboard by taking off the side panels above the night stands. It made all the difference! This duvet is one of my favourite finds. During my visit to the One of a Kind show last year I came across Old European Duvet. This Canadian company has some of the warmest and puffiest duvets I’ve ever seen (the kind you just want to jump right into). The pale grays, whites and touches of silver metal all add to the elegance of the room. The carpet acts as a contrast between the dark floors and dark furniture. The drapes pull in the colour of the headboard and the bed end acts as extra storage. It just goes to show you that taking an existing room’s furnishings and infusing it with a new colour palette can go a long way. 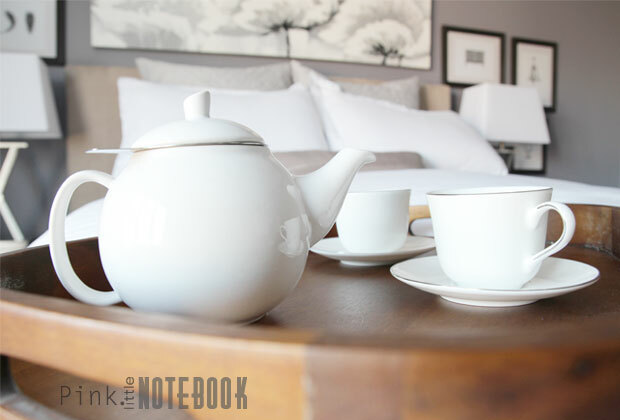 Altering the mood of your room can be as simple as some paint and new accessories! Well that’s it. They love it. I love it. It’s a happy ending! Hooray! Now moving on to the next project! Oh that wall colour! Beautiful!! Love the new look! Wow…what a makeover! Your finishing touches are just perfect. And I would have never suspected that colour would look so grey in that light. It’s gorgeous. Great eye! It’s just one of those colours that change in every type of light but still looks good! thank for the comment Meredith!! SABRINA!?!?! My gosh you absolutely NAILED IT! What a stunning transformation. And that color is to die for. It’s going on my list of PARA favourites. Aww thanks Tash! Yes, it is a gorgeous colour!! Oh my goodness. You killed it! That paint colour is absolutely perfect! Love the post! Thank you so much for doing this for us. I love coming into my bedroom now, it’s so cozy and inviting! You are an amazing designer 🙂 Baby room next! So pretty and welcoming! 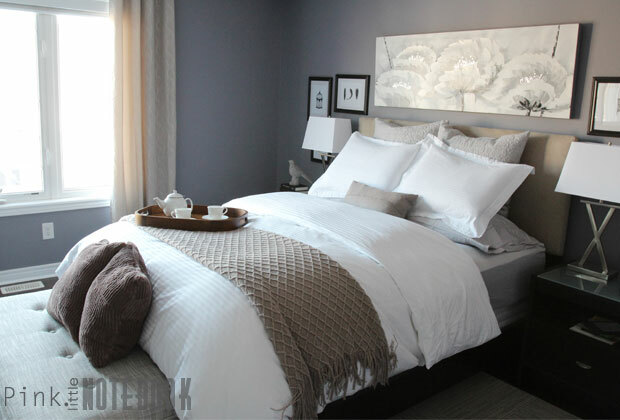 Love all the layers on the bed! Wow what a beautiful makeover! 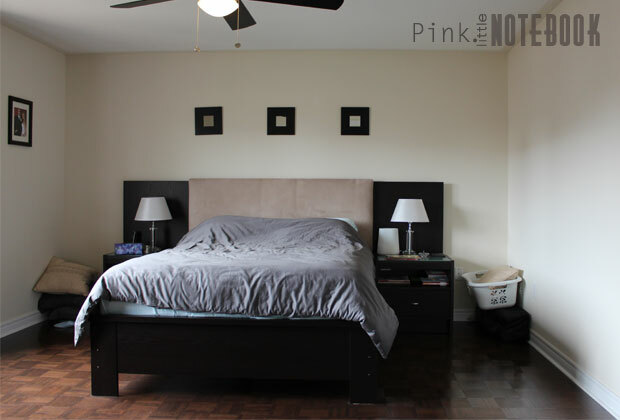 Our master bedroom needs new paint and I’m thinking of colours similar to the one you chose…now I’m inspired!! You should definitely go that route! It’s the ideal bedroom colour! thanks Jo-Anna! The room looks absolutely geourgeous! I love the bench at the end of the bed. It makes everything look so luxurious, especially with the duvet. And the colors are faboulous! Beautiful room! It looks fabulous. I love the paint colour and the rug. Great job! WOW!! What a beautiful makeover, absolutely stunning! Lovely makeover! That wall paint is gorgeous!! This looks amazing Sabrina. Like a fancy hotel! 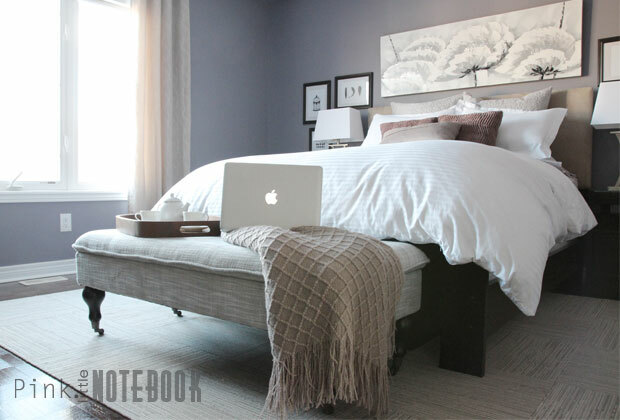 Ahhh…I dream of the day my master bedroom is at the top of the to-do list. We’d love it if you came over and linked up at The Makers! (at TinySidekick.com) Hope to see you there! I have to come over after seeing your highlight over on Tiny Sidekick. What an amazing transformation. Great job! Omg, you did a great makeover! This looks wonderful, so fresh and clean. I think it looks amazing – a wonderful makeover!! Don’t you just LOVE Para’s paint quality! ?